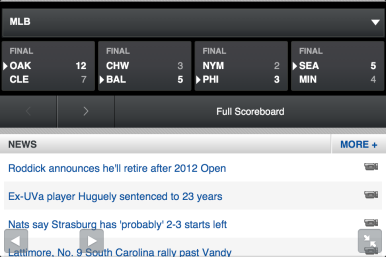 Safari for iOS was already perhaps the best mobile browser on the market. But in iOS 6, Apple has added a few features that provide much-requested functionality, as well as some minor tweaks that improve performance. If you’ve ever found yourself viewing a webpage in Safari on your iPhone and wanting to view it on the larger screen of your iPad or Mac instead—or, conversely, reading an article on your Mac and wanting to transfer it to your iPhone as you walk out the door—iCloud Tabs is for you. This feature syncs any open tabs among your Macs and iOS devices configured with the same iCloud account. Instead of going through the hassle of emailing one or more URLs to yourself, you can quickly view—on the device you’re currently using—any tab open on any of your iCloud-synced devices. iCloud Tabs automatically syncs tabs among all your iCloud-enabled devices and computers. Once configured, iCloud Tabs automatically syncs open browser tabs across all your devices—assuming that those devices have Internet access, of course. On the iPad, you'll see an iCloud icon in the Safari toolbar; tap that to get a list of the tabs open on your other devices. 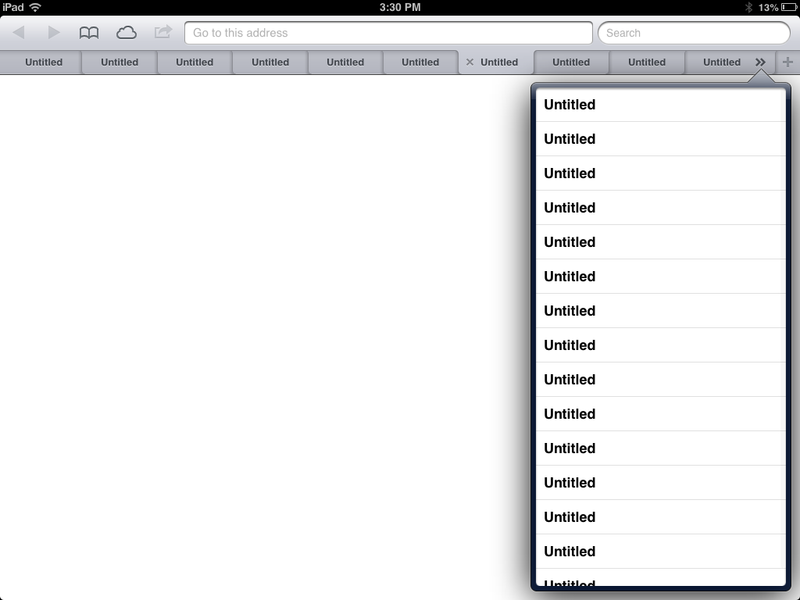 On your iPhone, you tap the Bookmarks button and then select iCloud Tabs. (If you’re already in a sublist in the Bookmarks list, tap the left-facing arrow until you reach the top level, titled Bookmarks.) Tabs are grouped by device, and each tab’s entry shows the name of the webpage and its URL; tap any item in the list to open that webpage on your device. On your Mac, you access synced tabs by clicking the iCloud Tabs button—which looks like a cloud—in Safari’s toolbar. Tabs are similarly grouped by device, although on the Mac they don’t display each webpage’s URL. 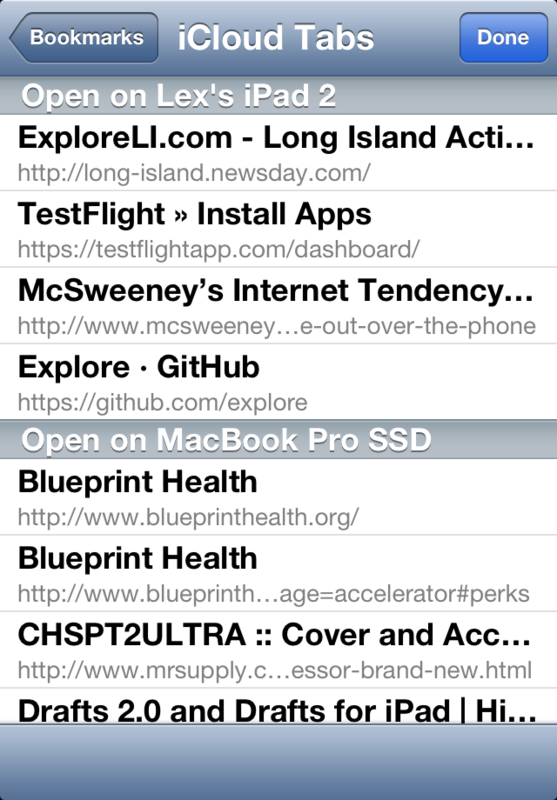 In iOS 5, Mobile Safari gained the Reading List feature, which merely let you save article URLs for later reading; those saved URLs were synced between devices, so you could access your list of saved links on any iOS device running iOS 5 or any Mac running Lion (OS X 10.7) or later. But Reading List under iOS 5 was essentially a glorified folder of bookmarks: Opening a saved URL still required a live Internet connection to load the article. In iOS 6, Reading List is much more useful. Now, whenever you add an article to your Reading List, the entire article—text, images, layout, you name it—saves to your device and syncs to your other iCloud-enabled devices and computers. In other words, assuming that each of those devices and computers has at some point connected to the Internet to sync the latest Reading List changes, you’ll be able to access and read your saved articles, even if you’re offline. 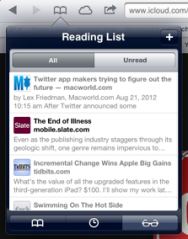 Reading List in iOS 6 lets you save articles for later offline reading. To add the currently viewed article to your Reading List in iOS, you just tap the Share button in Safari and then tap Add To Reading List. If you want to add a link on the current page, without having to visit the link first, just tap and hold the link until a menu appears, and then tap Add To Reading List in that menu. To access your Reading List on an iPhone or iPod touch, you tap the Bookmarks button in Safari and then tap Reading List. (If you’re already in a sublist in the Bookmarks list, tap the left-facing arrow until you get to the top level, titled Bookmarks.) On an iPad, you tap the Bookmarks button and then tap the Reading List (glasses) icon at the bottom of the Bookmarks pop-over. You can access a similar list on your Mac by clicking the Reading List (glasses) icon in Safari’s toolbar. Each saved article displays its favicon (site icon), its title, and a brief summary. Tapping Unread at the top of the list shows only unread articles, newest at the top; tapping All shows all articles (with read articles slightly grayed out). Tap any article to open it. To delete an item from your Reading List in iOS, simply swipe to the right over the article name and then tap the Delete button that appears. Safari’s Reading List feature still isn’t as good as services such as Instapaper and Pocket, which offer more features and better article-reading layouts, but Reading List is at least now more useful than a list of bookmarks. In iOS 6, you can finally upload images and videos to websites. 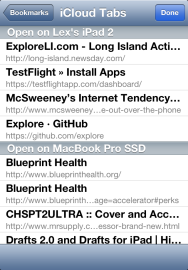 One of the most-requested features added to Safari in iOS 6 is media uploading. When you're using a website that allows you to upload photos or videos—for example, eBay, Craigslist, or a photo-sharing site—tapping the Upload or Choose File button on a webpage gives you the option to choose an existing photo or video from your Photos library, or to take a photo or video using your device’s camera. For the former, you just navigate to an album and then tap on the image you want to use; it immediately uploads to the site. For the latter, after you take the photo or video, and you’re satisfied with the way it turned out, tap the Use button to upload it. 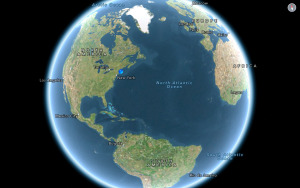 When viewing a webpage in landscape orientation on an iPhone or iPod touch, you can take advantage of full-screen mode to see more of the page. As bright and clear as the screen on an iPhone or an iPod touch may be, it’s still small—it just doesn't offer a lot of room for webpages to breathe. New to the iPhone and iPod touch in iOS 6 is full-screen mode, which is available only if you’re viewing a webpage in landscape orientation. Just tap the full-screen (opposing arrows) button in the bottom-right corner of the screen, and Safari’s address bar and toolbar disappear, giving the current webpage a good amount of additional space. Though Safari’s toolbar is hidden while in full-screen mode, three new, semitransparent buttons—forward and back for page navigation, and a button for exiting full-screen mode—appear at the bottom of the screen. 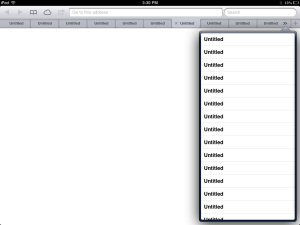 On the iPad, you can now have up to 24 tabs open. Prior to iOS 6, Safari let you open up to eight pages simultaneously on the iPhone and iPod touch, and up to nine tabs at once on the iPad. 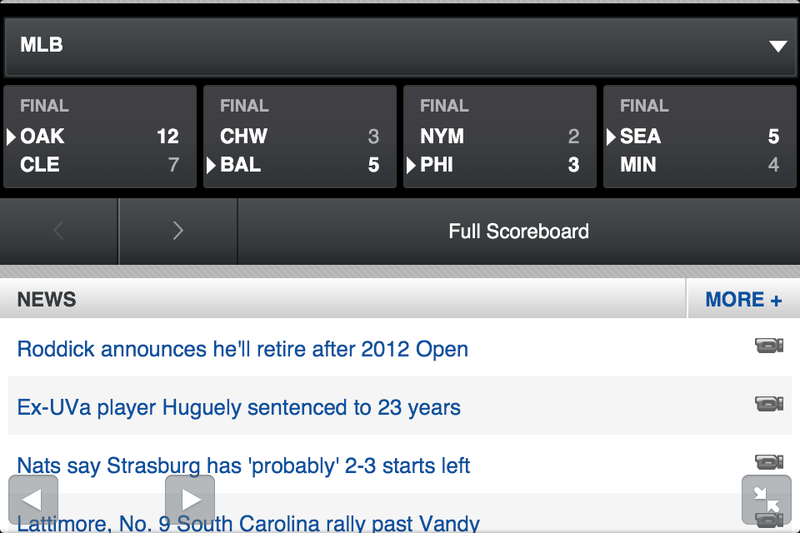 The eight-page limit remains on Apple’s smaller iOS devices; on the iPad, however, you can now open up to 24 tabs.